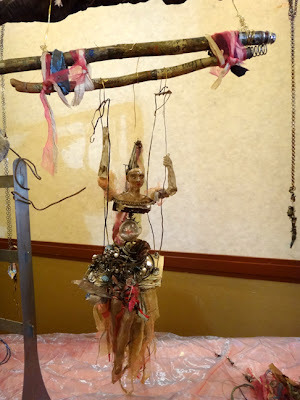 Susan Lenart Kazmer's Figurative Sculpture...her class was based around where you can take jewelry making. This piece actually holds a variety of jewelry which enhances the overall look and concept. It's just brilliant! The figure itself is made from ICE resin which was casted from a mold that she taught us to make first. The entire 2 day class was exciting and filled to the brim with techniques. A student's work from SLK's class. Had too many photos to post. I'm just glad to blog about these. From Diane Cook's class "Framed" we made necklaces with photos framed with Mother of Pearl buckles which were in our kits for class. I actually learned how to drill holes in the MofP under water. What a thrill to be able to do it. This is one of Diane's pieces that I admired. 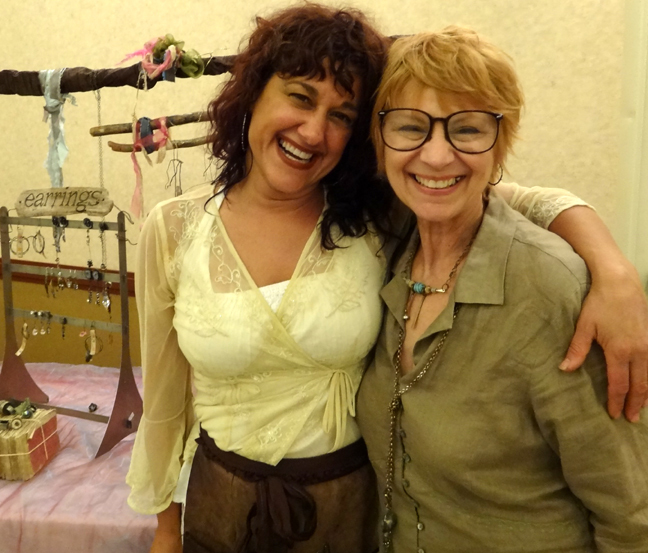 A photo below taken with Diane, I am wearing what I created in class. These are student pieces made in Lisa Pavelka's "Framed" class using Art Clay which is created using torch firing. I particularly like the ones that have the black and white stripe edge. My piece did not as it just didn't work out. I was however, thrilled beyond belief to be able to create with Art Clay using the torch. At one time you could only finish with a kiln which I wasn't willing to purchase know my "moving on to other things" attitude. I first learned of Lisa when I was working with polymer clay which she is proficient in. It was a good class. My final class was with Debbi Simon teaching casting and making pieces from originals that I love and am selective about what I want to do with it. The technique taught feed me to create another into resin and make it look like a bronze metal piece as shown here. These are actually resin with bronze metal powder mixed in. It was fascinating and I was filled with ideas by the time I left the class. Debbi is a great teacher as are they all. She teaches for Beaducation and is very knowledgeable about so many different techniques. I am glad to have discovered her. 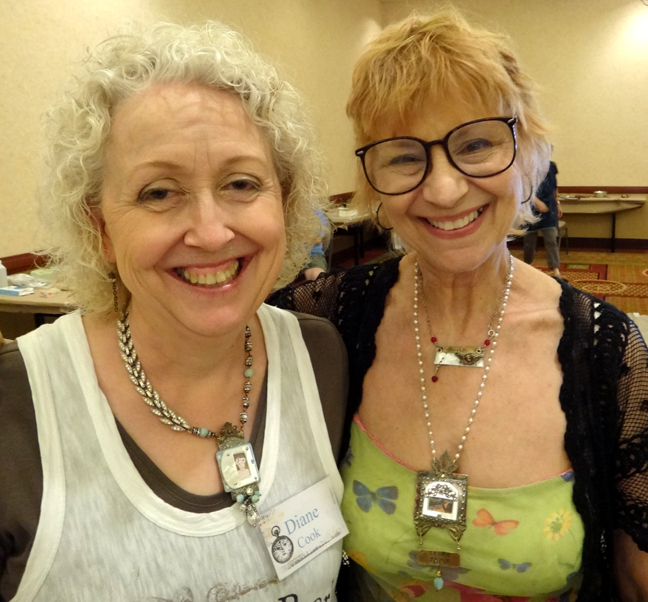 Diane Cook and me wearing what I happily created in her fabulous "Framed" class. Susan and I at the end of her 2 day class. Look at that smile on her! She is really like that all the time...bubbly, happy and puts out an enormous amount of energy teaching. She has an enviable career well deserved. I don't know any other artist quite like her and her incredible designs. Love, love, love! 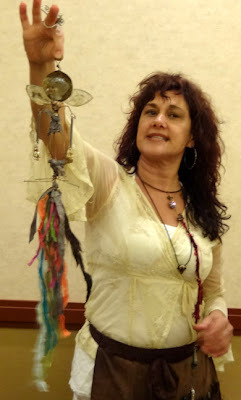 Susan is holding what I created in her class. I have plans to change some things and add to it. It was very challenging for me to create such an expressive piece of work in just 2 days. Usually it takes me weeks to make something a lot less involved. I was proud of my attempts. Art Unraveled is one of my favorite teaching venue because I can drive there, it has fabulous classes/teachers, it is well organized by Linda and Chuck and I get to visit with lots of old and new friends. Speaking of friends, I once again stayed with my wonderfully brilliant and creative friend, JoAnna Pierotti and her sweet and loving husband, Ron. Each time I stay with them, I get to know Jo and Ron better and better and they have added to my life experience with gracious hospitality and friendship. I just love them both...and my puppy face, Willow too. I am blessed to call them friends. I look forward to seeing and sharing time with them again, hopefully next year.